Up for your consideration is this 2016 30th Anniversary 3 ounce. 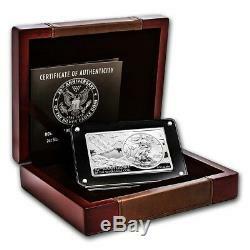 999 silver American Eagle coin bar with mint packaging and certificate of authenticity. THESE ARE EXTREMELY LIMITED SILVER BARS SO GET YOURS NOW WHILE THEY ARE STILL AVAILABLE! The American Silver Eagle is the single most popular bullion coin the world right now. 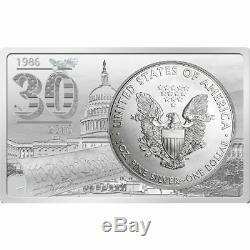 Produced by the United States Mint on annual basis since 1986, 2016 marks the 30. Anniversary of a coin program which recently set a sales record of 44 million coins in a single year (2014). Anniversary American Silver Eagle Coin bar from LSPMEX. 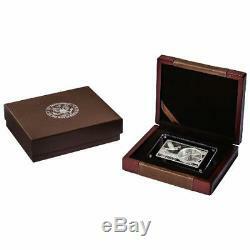 Each product features a 2 oz silver bar and 1 oz silver coin in a decorative wood display box. Individual coins contain 1 oz of. Total precious metal content of 3 oz of pure silver. Please note the 2 oz bar is not an official US Mint product. American Silver Eagle coins were introduced in 1986 by the United States Mint to serve as the official silver bullion product of the federal government. Silver stores were released from the Defense National Stockpile to strike the coins in an effort to raise additional funds for the federal government. The Treasury and United States Mint chose Adolph A. Weinmans Walking Liberty design from 1916 to feature on the obverse face of the coin. In the design, Liberty is featured striding toward the setting sun with the American flag draped over her shoulders. The imagery is representative of the nations constant march toward a brighter future. John Mercanti, Chief Engraver of the US Mint, created the heraldic eagle image used on the reverse. A bald eagle is set behind a heraldic shield in the design, with a 3-point set of 13 stars above its head representing Americas original colonies. Mercantis image was created specifically for this coin program. Anniversary product, you receive a 2 oz. 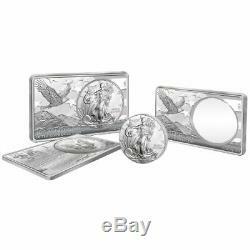 Silver bar with an inset space for your 2016 1 oz American Silver Eagle Coin. You can mount the American Silver Eagle within the face of the bar, creating a stunning combination of a high-value bullion coin and a silver bar. 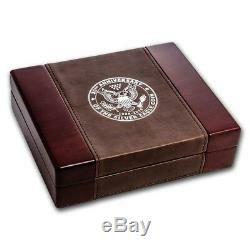 The United States Mint produces American Silver Eagle coins predominantly at the West Point Mint in the 21. Century, though the Philadelphia and San Francisco Mint facilities occasionally contribute to production. Thank you very much for looking at our listings! 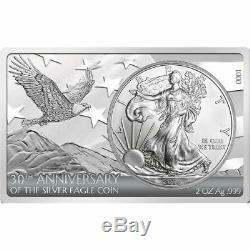 The item "2016 30th Anniversary 3 oz Silver American Eagle Coin Bar WithMint Packaging & COA" is in sale since Monday, November 5, 2018. This item is in the category "Coins & Paper Money\Coins\ US\Collections, Lots". The seller is "lspmex" and is located in Texas. This item can be shipped to United States, Canada, United Kingdom, Germany, Japan, France, Australia, Denmark, Romania, Slovakia, Bulgaria, Czech republic, Finland, Hungary, Latvia, Lithuania, Malta, Estonia, Greece, Portugal, Cyprus, Slovenia, Sweden, Indonesia, Belgium, Hong Kong, Ireland, Netherlands, Poland, Spain, Italy, Austria, Bahamas, Singapore, Norway, Saudi arabia, United arab emirates, Bahrain, Croatia, Malaysia, Chile, Colombia, Costa rica, Panama, Trinidad and tobago, Guatemala, Honduras, Jamaica, Viet nam, Uruguay.